2. Learn to drive. – Done in 2008 when I migrated to LA and I realized, I wouldn’t be able to go anywhere without learning how to drive. 3. Attend a music festival. – Done in August 2015 when Stephen and I went to HARD Fest. 4. Travel to a place I’ve never been to by myself. 5. Write a book and get published. 7. Swim with a dolphin. 9. Have a professional photo shoot. 10. Ride the Napa Valley Wine Train. 11. Ride a train that would cross two countries or two states. Be at the border of two states. 12. Ride an air balloon. 13. Spend New Year’s Eve in Times Square. 14. Own my own condo unit or house. 15. Ride a cable car in San Francisco. – Done in 2016 when we went up North to attend JP and Diane’s wedding. 17. Take a photography class. – Half done. Did manual photography. I sucked. So will try digital photography classes next time. 18. Eat a meal from a world class chef. 19. Live abroad. – I moved to live in California in 2010. 20. Run my own successful business. 21. Be completely out of debt. 21. Ride a double decker bus. 23. Eat at a Michelin award-winning restaurant. 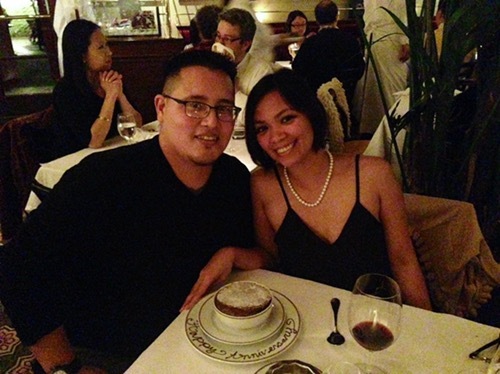 – Done in July of 2013 when my husband brought me to Bouchon for a surprise dinner…. UPDATE: So turned out the Bouchon I had dinner at in 2013 was not the branch that was Michelin star rated but last weekend, my husband and I had our 2nd anniversary dinner at Bouchon in Yountville, CA. This is the Michelin rated branch and needless to say, we had an absolutely amazing experience. 24. Ride a roller coaster. 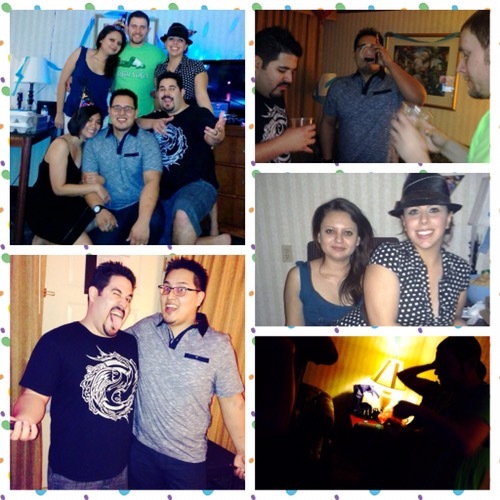 – Done on August 22, 2014 when we went to Knott’s Berry Farm for Reiszn’s birthday. My husband tricked me into riding the Ghost Rider and my brain literally hurt when I got off! 30. Throw a surprise birthday party for someone. 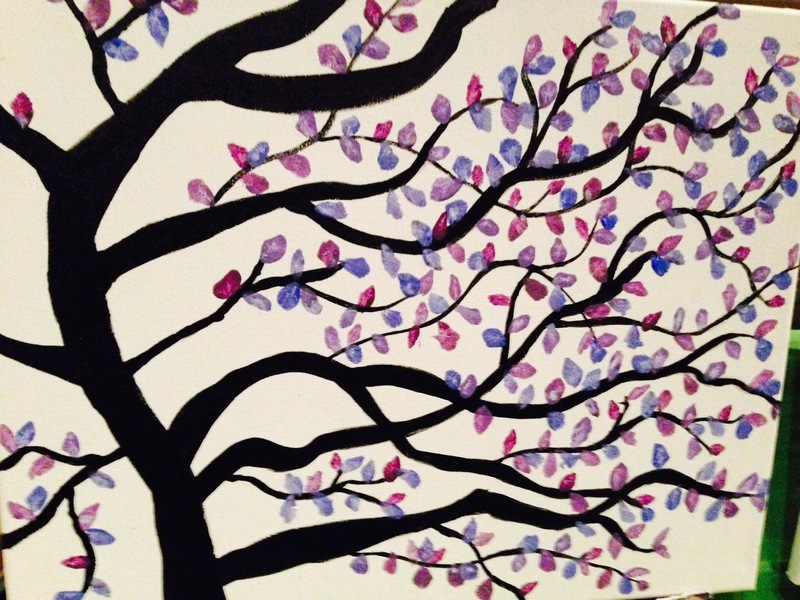 – Done on March 15, 2014 for my hubby and the look of surprise on his face told me it was a success. 🙂 I was again successful with his surprise birthday party in 2015 (at Katie & Brent’s apartment) and in 2016 (at Huntington Beach). 32. Paint something. – Done on April 15, 2014 with my dear friend, Claudia. 34. See the Northern Lights – Done on November 10, 2017. Unfortunately, we were not able to take pics but the experience will always be in my memory. 35. Experience a natural hot spring. – Just realized I crossed two items in my bucket list in the same day! I also experienced this on November 10, 2017 when I went to Chena Hot Springs in Alaska. Set foot on all the continents – Africa, Antarctica, Asia, Australia, Europe, North America and South America. Times Square in New York – Did this back in January 2011 with one of my best friends, Peng. Alaska – Visited Fairbanks, AK on November 8-12, 2017.